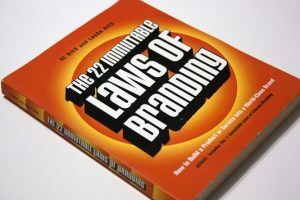 The 22 Immutable Laws of Branding by Al Ries and Laura Ries, published in 1998 by Profile books. What should a brand leader advertise? Brand Leadership, of course. Leadership is the single most important motivating factor in customer behaviour. – Heinz, America’s favorite ketchup. Heineken, America’s leading imported beer. Coca-Cola, the real thing. Visa, the No.1 credit card in the world. Barilla, Italy’s No.1 pasta. Goodyear, No.1 in tires. And some very, very good advice in relationship to line extension, and it’s fairy sister, line contraction. “Come alive with the Pepsi generation” became, in Chinese: “Pepsi brings your ancestors back from the grave”. “It takes a strong man to make a tender chicken” translated into Spanish as “It takes an aroused man to make a chicken affectionate”. And Coors beer were probably upset to find out that their slogan “Turn it loose” rendered in Spanish as “Suffer from diarrhoea”. “22 Immutable Laws of Branding” by Al Ries and his daughter Laura has a lot more useful wisdom, though. They run a marketing agency which is further developing the technology of positioning first made famous by Al Ries and Jack Trout. The examples with which the book is richly populated are naturally major brands and household names, most of which are as recognisable in the UK as in the US. But the principles are as applicable to small and/or relatively unknown companies in any sector. Where the earlier work on Positioning suggested that the product ladder in any given category would accommodate up to about 7 names in the prospects mind, 22 Immutable Laws leans towards the idea that what you really want is your own category. There is a lot here about how you can go about making your own category and the long-term value of that. How to establish it, and how to protect it once you have it. Also, how you can wreck your own good work by diluting a brand once it has been established.